Find My Workspace lists over 95% of the serviced offices market in Free Zone. Simply click Request Quote to check pricing for one office, or Add to Basket for multiple offices. Strategically located at the prestigious free zone, where you can enjoy 100% foreign ownership of your business, this 33,000 sq ft business center is one of the largest in Dubai providing fully serviced offices, meeting rooms and virtual offices, having a wide variety of office solutions starting from a single workstation to an unlimited number of offices. Additionally, this center offers value added facilities such as concierge services, in-house F&B catering, FedEx Kinko’s copying center and VIP executive lounge. This center now offers virtual offices. Looking at testing out a market at an incomparable cost? Explore the professional arena with an amazing virtual office package. Get connected. Professional mobility starts here! This limited offer is designed to take your company virtually anywhere and set its footprint in different time zones. Run your business like a multinational, on a smart budget! This package includes , a business landline and fax number (selected by you! ), a prestigious business address with a receptionist answering your calls, in your company name. You will have access to conference rooms and business lounges, as well as a PO Box, mail forwarding, fax forwarding and a hot desk. 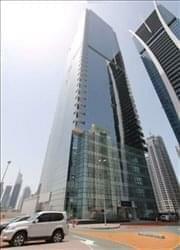 Strategically located in Dubai on Sheikh Zayed Road in Jafza’s office complex of 30 floors. The location offers 40 fully furnished and equipped offices and two meeting rooms over 1,034 m². The office complex also offers an array of retail outlets, restaurants and cafés. More than 10 restaurants and eateries provide opportunities for either a casual lunch with colleagues or a more formal meal with clients. This center offers fully furnished executive office suites ranging from 147 to 500 sq ft, including use of common areas (reception, business lounge, service areas and toilets). No additional service charges for air-conditioning, lighting, water, full time security and electricity. Free maintenance, daily housekeeping and daily office cleaning service. To obtain information for your selected Free Zone Serviced Offices, please tick the "Add to basket" box for each office you prefer and complete the form below. We will then send a detailed report via email.